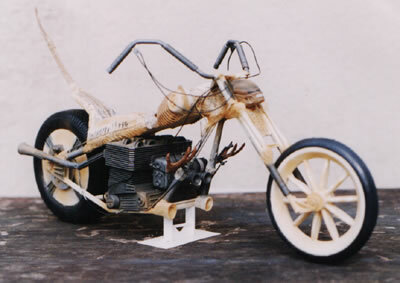 Sometime back I made a model of a Revell 1/8 scale trike kit but I made it more to European style than American, the model is called the Dragonfire and the main part of the frame is formed as a basic model of a Dragon with all the fittings coming off from it. As a typical model maker I could not bring myself to throw this away and so I made it up and then thought about doing this. 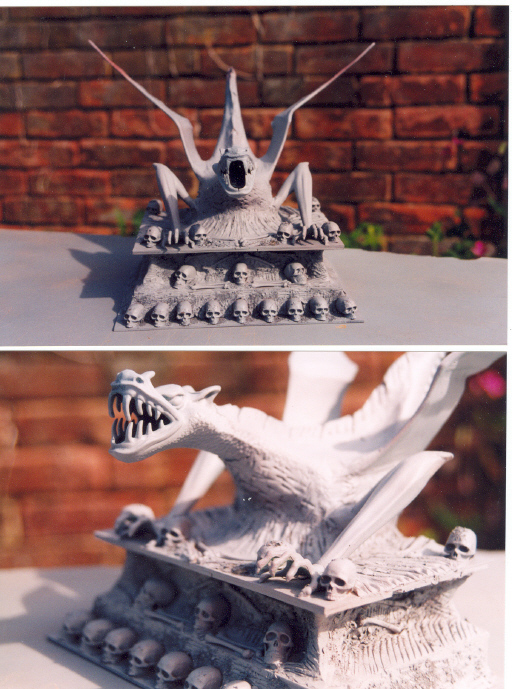 I fitted it to a piece of thick card and then added a step to give it some height, around top and sides I started to add some Verlinden skulls and bones and then started to blend in some Das clay, I soon realised it was semi Alien looking, I then sprayed the whole thing with car undercoat grey and black. The end result is quite pleasing and its better than dumping anything !! I find science fiction subjects interesting, I’ve never been keen enough to make or collect them. However, the space jockey figure from the first Alien film was the exception and has held an interest for me since I bought the book of the making of the film back in 1980. At that time I was getting more and more into semi-scratchbuilding and model conversions, but, as I’ve already said, these were mostly military. The book was often looked at and, finally, when I thought I was ready, I started to scratchbuild a jockey. 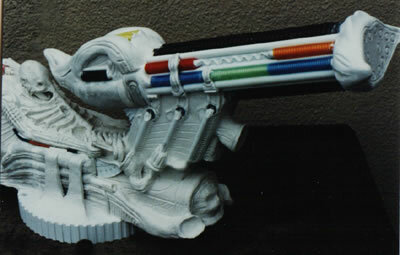 The finished model appeared in Hangar 57, Sci Fi and Fantasy Models magazine Oct/Nov 1996 and had been a stop-start project for almost two years. The finished result was all right, but I wasn’t really satisfied with it. A couple of years ago I’d also looked at the Halcyon model of the jockey, and was very impressed, but, for the size of model, I felt the price was too high. It looked as though another scratchbuild was the answer and, although it turned out to be quite an expensive one, it was far more pleasing to make and a lot bigger than the kit. 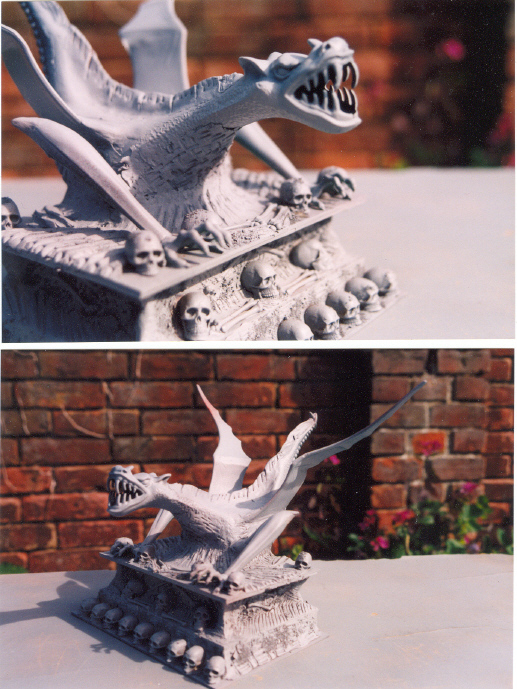 Prior to me starting the model, my son had bought me a book tided Giger’s Alien, and so, armed with two decent books of photographs, I felt it would be a fairly straightforward task to build one… wrong! I first spent a couple of days working on the piece in March ’96, making the head from Das Pronto and fixing it to a piece of 80 thou plastic card. Once I was happy with the “chin on chest” appearance, I laid a slab of Das Pronto about 1/4″ thick x 2″ x 4″ to the length of plastic card and then made an armature in a rough triangle shape in order to get the head angle parallel with the body and correctly positioned, or as correctly positioned as possible by referring to the photographs. In January 1997 the armature had sides fitted to it. These were kept quite narrow and templates were used to cut crudely shaped arms from 60 thou plastic card. These were fitted to the sides, with a guess being made as to their correct position. When all the plastic fittings were dry, “ribs” were made by rolling out pieces of Das to an estimated thickness and laying them onto the chest. Large sheets of Das were rolled to about 1/8″ thick, laid around each arm and shaped to the plastic. Everything was left to dry for a couple of days. This couple of days turned into a couple of months as I had other models to make, but I returned to the project in May ’97, and this time determined that I would finish it. At this juncture (and I’m sure many modelmakers do the same) I thought, “Is it taking shape?” “Is it worth carrying on with?” I eventually decided it would turn out all right and determined to complete the jockey. Finished Close Up Shot Over the next few days I started adding pieces of plastic card to the front of the armature, gluing two pieces of 2″ drainpipe to the back of the seat. When these pieces were dry they were covered with thin sheets of Das Pronto. The whole figure was then fixed down onto a piece of plywood 11%” in diameter and 1/2″ thick. This was covered around the edges with 40 thou plastic strip to give the “cog” appearance. The top of the disc was covered with thin sheet Das. The side slabs which the jockey’s arms appear to “rest” on were made in various stages. The main central slab under the arm was first made from 1/2″ thick rolled Das fixed to the side. When I thought this looked right, the grooves were formed with a paint brush handle whilst the Das was still damp. It was time to make the hands, which would be the worst parts of the whole model to create. Making hands and feet is – to me – worse than any kind of horror story. In the end I decided on two slabs of Dos about 1/4″ thick cut into mitten shapes. The fingers were then crudely opened up and wrapped around pieces of 1/4″ tube to keep some sort of shape. Before the hands were dry I fixed pieces of 1/4″ tube to the wrist end and glued these to the ends of the arms using the tube in the fingers to angle them slightly outwards as can be seen in the photographs. Everything was then left to dry. A couple of days later, after making various other small parts, I started carving and filing the hands to shape. They still looked like smooth gloves, so I added very thin, rolled out strips of Dos to the fingers and right up the arms. This was quite a tricky job, but looked pretty good when everything was finished. A piece of 30 thou plastic card was shaped to go behind the jockey’s head and fixed to the base of the rear armature. Off-cuts of plastic were glued into various gaps between this piece and the top of the drain-pipe pieces and also at the bottom behind the side bulges. These could then be covered in pieces of Dos Pronto and shaped as I went along. Behind the rear side seat bulges I added two lengths of 1/4″ tube at each side, and behind these I added a piece of 3/8″ tube which had first been sheathed with curtain rings of 7/8″ outside diameter. Thirty per side were needed. The tops and bottoms of these tubes could then be blended in with Dos. The same procedure was applied to the tubing on the seat rear, with the centre tube being covered in a key ring spiral. The top of the centre tube had a “crest” formed from Das added, which ran up to the seat top. Das was also added to the seat top, covering the whole top plate up to the pilot’s head. This was shaped whilst still wet. Rings 1/8″ wide and 5/8″ in diameter were cut from an old felt tip pen with 1/2″ tube inside set in steps down to 1/4″, and the whole assembly sunk into the wet Das. 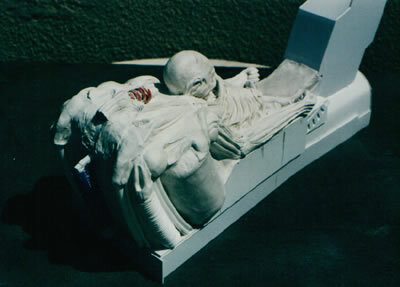 The long, bone-shaped pieces at the front, back and bottom of the model were next. First, two pieces of 80 thou card were glued to the lower armature, about 3/4″ out at right angles, and pieces of Das were fitted above and below this. Pieces of card were also fitted at the bottom rear of the large side slab to point just past the curtain using upright tube. Again, Das covered the top and bottom of this. Fortunately, this was my last job late one evening. The next day large pieces of Dos were fitted over the whole front assembly and shaped and reshaped until it looked right. The same treatment was given to the rear pieces and then grooves were blended from the side pieces into these. The whole, elongated part of the armature was covered with a thin layer of Das. After leaving everything for a couple of days I made the two uprights for the telescope from 80 thou card, glued down inside the front pieces to the base and reinforced with pieces of scrap plastic as I knew the telescope was going to be heavy. The other ribs (bones?) from the rib cage up to the telescope base were rolled strips of Das in “V” shapes. The next couple of days were spent making all the little details. First, the steering handles were formed by gluing two pieces of 1/4″ tube at right angles to each other. One end was placed through the hand, the other superglued to the side of the “V” pattern. These were then covered with two rolled out loops of Das. The handle top detail was made from 1mm plastic rod and Das. Very thinly rolled out Das was added across the rear seat humps and over the arms and painted in with water whilst still wet. I next started on the telescope, beginning with the bulk piece at the pilot’s end. This began life as a plastic container 5″ x 2 1/2″ x 2″ covered with shaped Dos added in three stages. The coiled pieces at either side are key ring spirals cut and bedded into the Das. The rest of this bulk part was added to with Das or had parts cut back and shaped. Key ring spirals were also bedded into the top. The main body of the telescope is 80 thou card formed into a rectangle approximately 12″ long by 2″ x 2″. Various side steps were created by adding strips 1/4″ x 1/8″ along its length. I next fitted 3/8″ tubing inside key ring spirals – three on each long tube and two for the ones with gaps in the middle. Work in progress shot The two thicker top and bottom coils were found at a car boot sale. I’m not sure what they are far, as they were marked simply “heavy electronic cables” (fairly obvious, really). These large spirals are about 3/8″ in diameter and were pushed over pieces of 1/2″ dowelling to keep them straight. When finished, the tubes were glued to the main box sections. The shaped piece at the front of the telescope was again made by three sections of Das and, finally, by smoothing and shaping the last piece and blending it into the tubes. When everything was completely dry the telescope was fitted to the plastic card uprights. The side tubes on the supports are from 3/8″ tube blended in with Das top and bottom. These bottom pieces were made to join each other and finally brought around to finish just in front of the steering bars. The horn-shaped piece and slab under the telescope are Das over a plastic piece for strength. I spent a couple of hours going over the model to check for broken or chipped pieces or parts that had fallen off. At last the beast was finished! Well, no not quite. I painted the telescope down to the front and rear bones and rear tubes in grey car primer. 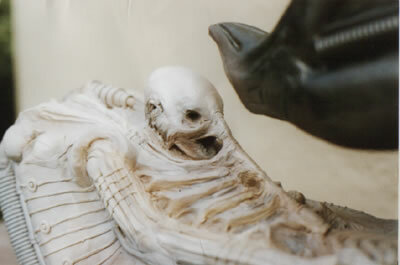 The figure was then sprayed in white car primer. After a couple of hours, the grey areas were sprayed with metallic charcoal car paint and the whole thing left overnight. Most of the next day was spent airbrushing various shades over the light areas and blending them into the dark parts using ivory, light grey, tan, rust, gunmetal and a few made-up colours. The model devolved from what I thought was a good finish to what I considered to be a terrible one. I therefore left the jockey for a while and started again, finally finishing the piece as you see here. Although some people may disagree with the finish (I certainly do) I decided that enough was enough. I had really wanted to complete the project, at least for photography, by making the large circular floor and fittings and rear wall section featured in the movie, but the floor would have been around 4′ in diameter and the wall 5′ x 2′ so that idea has been abandoned – for now. The parts used are as stated and I’d like to thank Mr. Perkins of Perkins Distribution for the speedy supply of Evergreen products, without whose help some of my models would still be all in the mind. 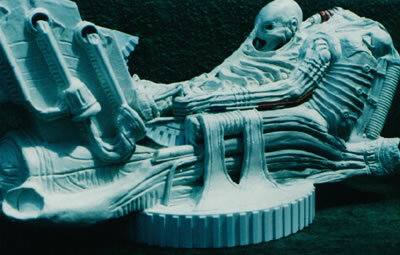 The BioMech bike can about after reading Geigers alien book when he describes his drawings as bio-mechanical. I had an old Halycon model of the alien that was given to me and was wrecked. Instead of rebuilding it in kit form i decided on something different. The front wheel is a trolley wheel from B&Q’s. The main frame is from 1/4 and 5/16 inch evergreen tube. The alien chest and tail were fitted to a piece of shaped das clay to form a fuel tank and seat combination. Tube and bones make up the front forks. The engine was made from pieces of 40th card and detailed with various strip and rod. The alien head was added to the top front of the forks, and the hands are now footrest.